A specially formulated cement-based floor and wall tile grout recommended for bathrooms, kitchens and domestic applications. A 3Kg bag offers approx. 6m² coverage, which is a typical sized bathroom installation. Ideal for use over timber ply-boards and heated sub-floors. Makes it suitable for both floor and wall applications as well as for internal and external tiled surfaces. Helps to reduce black spot mould growth. 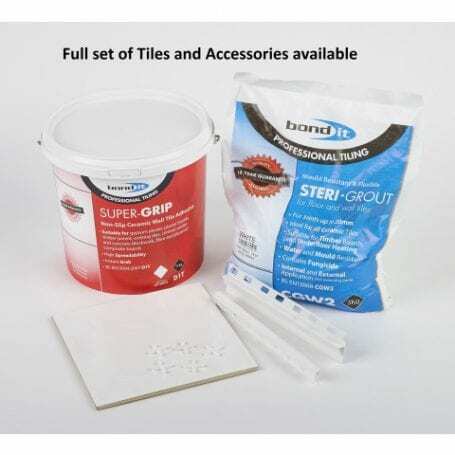 Steri-grout has been formulated to be slump-free and flexible as well as capable of filling deep joints in just one application and therefore has excellent adhesion characteristics to porcelain and fully vitrified tiles. The ideal combination for tiling jobs where white tiles have been used and colour uniformity is key. Dependent on site conditions such as thickness bed and ambient temperature. Has passed the minimum pass levels tests that are mandatory.